Taking a cue from Kelly, I thought I'd post a few pictures of my scrappy space. 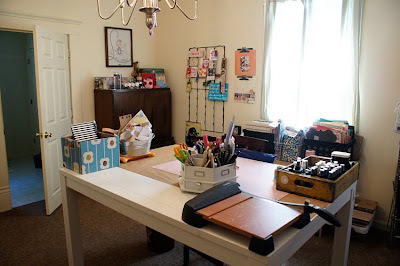 I am extremely lucky to live in a 3-bedroom house with my husband and no kids, so when we moved into this house, the third bedroom was "given" to me as a space to craft. 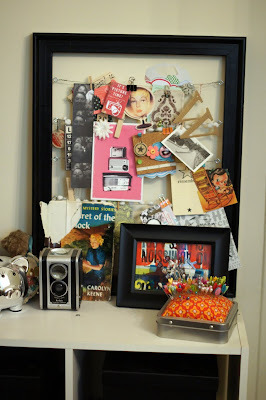 An inspiration board that holds lots of bits and pieces I'm too stingy to hide away in a book. I have another hanging inspiration board that has 50 clips for pieces I want to keep in sight while I'm working. 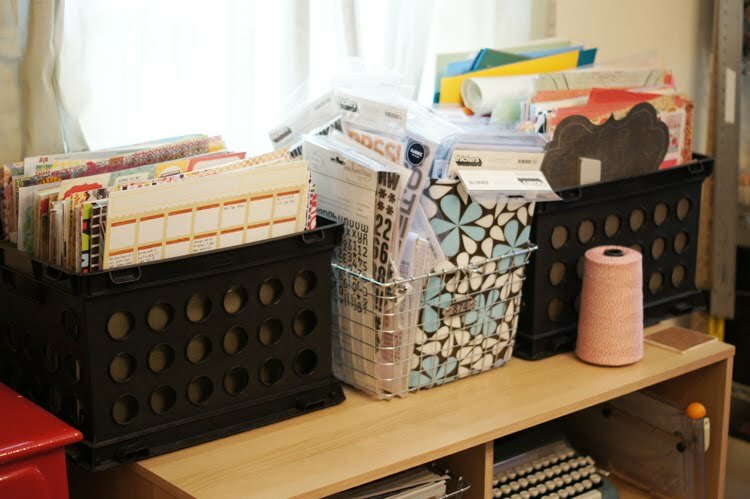 Right behind my craft table is my stash of paper, filed in these crates by manufacturer, my Thickers, Scrapbook Trends and Cards magazines, as well as a vintage typewriter that was a gift from my parents. 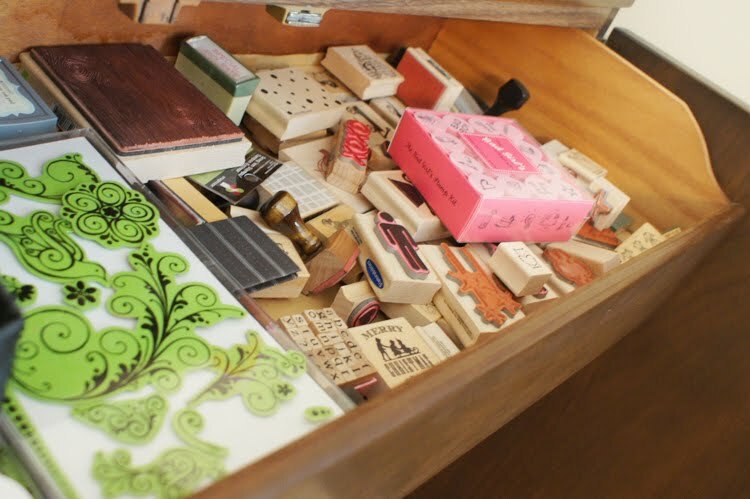 I have a giant mid-century cabinet I bought from a friend for $50, and it holds all of my stamps, miscellaneous tools and lots of other things I want to hide away. I keep my bits on top - mostly buttons, brads, chipboard, etc. 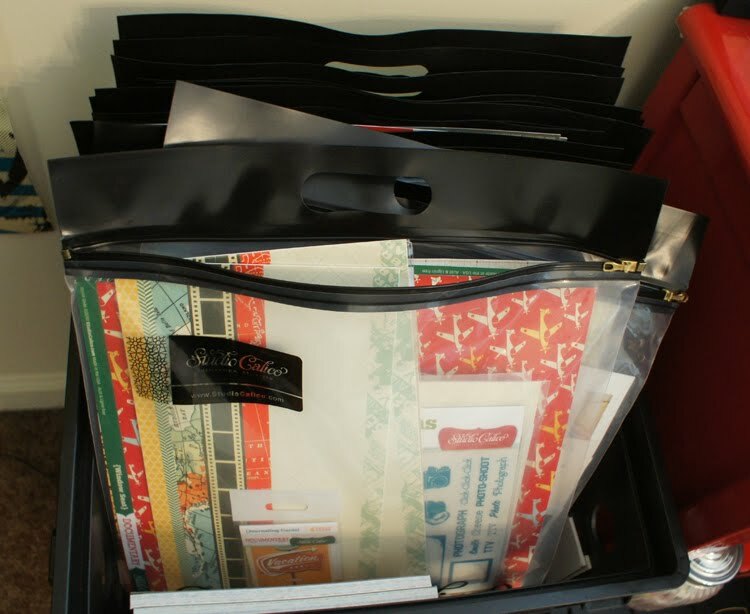 Down close to my crafting table, I keep all of my kits and collections in Studio Calico Crop Bags - they have saved my scrapbooking sanity since they came out. 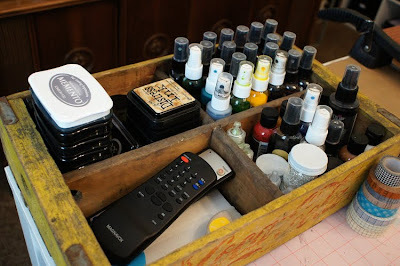 I have a vintage Coke crate that holds my inks, paints and mists, and scattered around are wire shelves that hold buckets and bins full of more flowers and chipboard than any one person needs. Oh, and also, all of my fantastic SC stamps. So that's it! The place where I create. It's by no means perfect, but it's mine and it's my happy place. 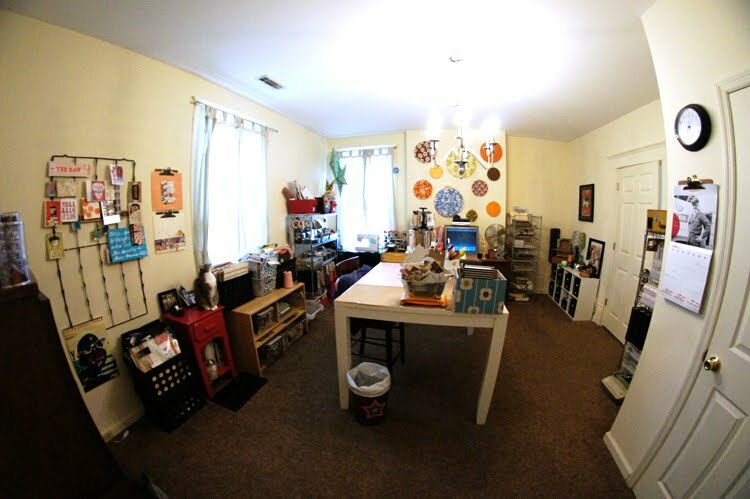 WOW Stephanie your craft room is BEAUTIFUL!!! I love your vintage stuff and how you store your SC stamps is genius! 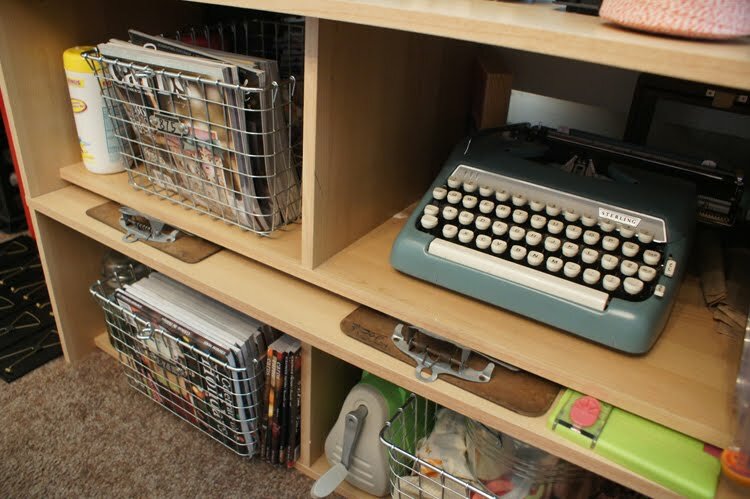 Super cute typewriter too! 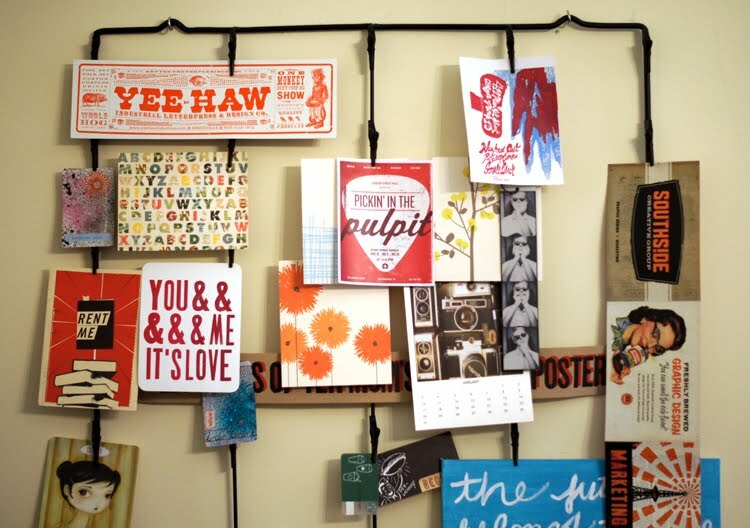 I love your space,it's so inspiring! This is awesome! You are so lucky!! I love this, makes me want to go in and explore. 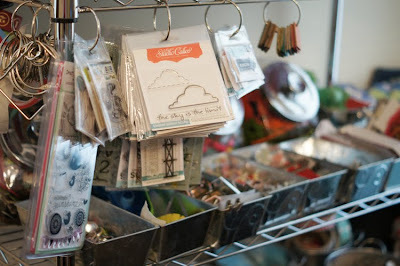 I'd love to see an overall view of that shelf unit that holds all your buckets of goodies and has the SC stamps on it. That looks posatively yummy! 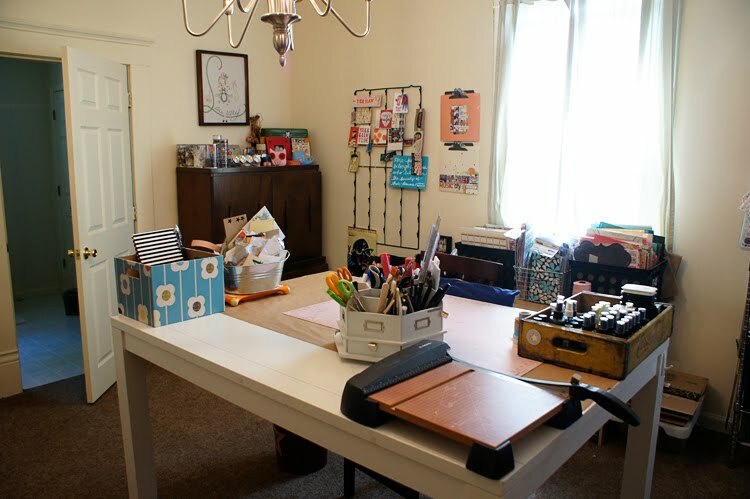 Totally in love with your craft room! It's always great to get some inspiration from others. I'm so in LOVE with your scrap space! 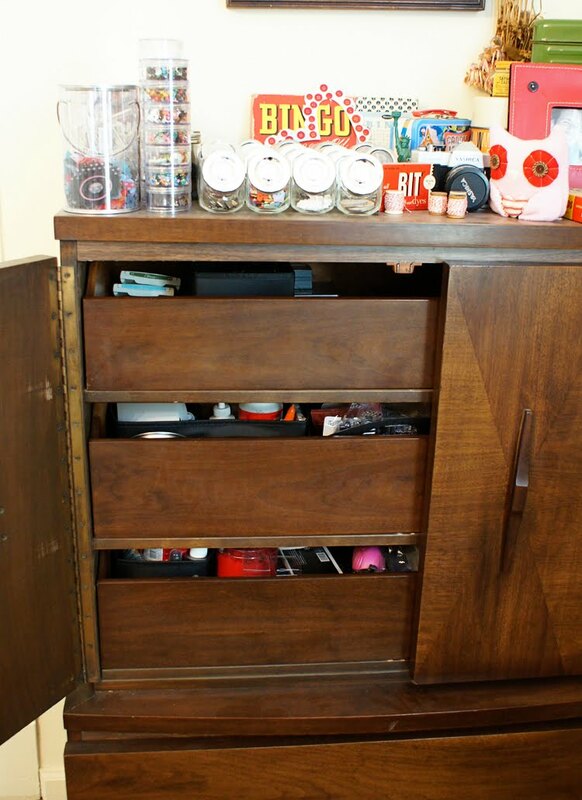 So neat and well organized! Good for you Stephanie! I adore your scrap room, it looks like a lovely place to create! 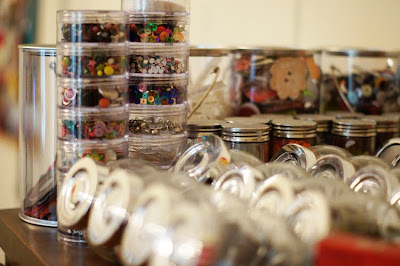 I like how you store stamps on a binder ring! thanks for sharing your space. Your craft room is just beautiful! Love that wall full of embroidery circles that give a pop of color! I love your craft room !!! wow love your craftroom !!! Wow! When can I move in for a weekend? Loving your space...it's lovely and inviting and very inspiring! I love the Coke crate- I need to add that to my list of things to get! Your desk is awesome, too- exactly what I need! Thanks for sharing! 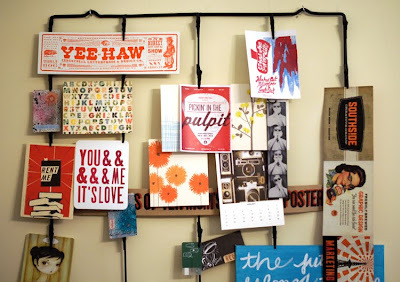 Fab room...I really love your hanging inspiration pieces!